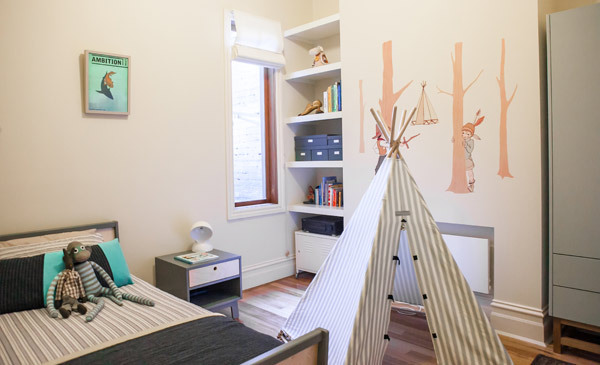 The brief was for a girl’s bedroom that needed to double as a playroom for both daughter and son – sound tricky? Not for this talented mum! Eleonora’s mum Mina Tiesi, a freelance interior designer, knows what it takes to create an awesome bedroom and how to execute it beautifully. Eleonora is one very lucky little lady to be able to call this bedroom her own, with its sublime neutral toned colour palette and modern furniture that will last her many, many years to come. I love the clean, modern look of Eleonora’s bedroom. 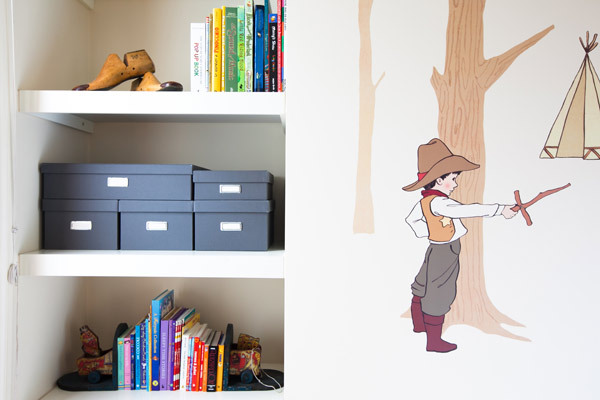 While everything has a place, it remains childlike with the finishing touches Mina has carefully thought about – the gorgeous wall decal softens the cool tone and a smattering of bright books adds a pop of colour to a corner. Mina writes: I designed Eleonora’s room to double as a playroom as this is the only bedroom downstairs near the living area where we spend most of our time when home. The space needed to be fun and appealing so the toys would be contained here and not strewn through the rest of the house. Her room also needed to accommodate her brother’s playtime during the day as well, so making it overly pink was not an option. Having lots of shelving for books and a carpeted area were essential elements. As the children grow, imaginative play in the tee pee will probably be replaced with imaginative drawing time on a table and chair setting. The room took approximately six months to complete, from designing and sourcing to implementing. 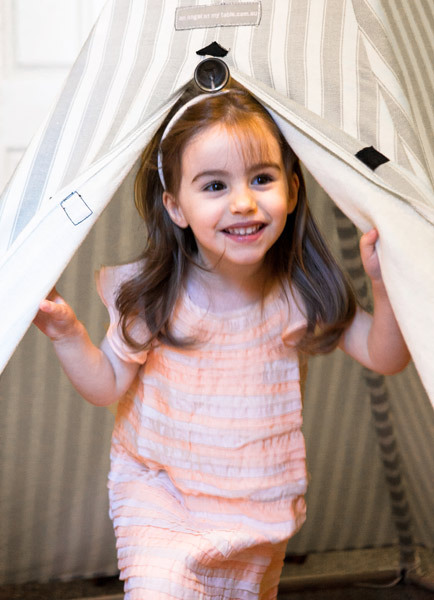 There is no doubt in my mind that Eleonora (pictured below) and her little brother will have hours of fun ducking in and out of the teepee and cleaning up with the help of the little wheelbarrow wagon (or just ferrying soft toys around)! Mina has included a whole pile of sources of where she found certain items for Eleonora’s room, so be sure to check the list if you see something you love! The wardrobe was a custom build, the bookends and wagon were found in a second-hand store and the rug, an eBay find!